For over 30 years, CMS had provided business software solutions for mid-sized manufacturing and distribution companies. While their history was impressive, the company brand and marketing was showing its age. The CMS management team realized they were struggling to keep up with modern marketing trends and maintain their outdated WordPress website. Not only did the CMS website desperately need a face lift, their disjointed brand message and inability to stay relevant to customers prevented them from competing in the ERP space. 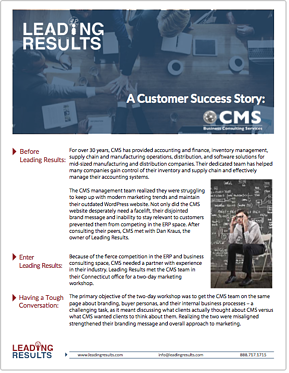 Read this case study to learn how Leading Results helped CMS modernize their message and their marketing assets.